Raizer band is a four young musicians singing in English, whose story begins in 2014 in Eastern Europe. They are playing music, which can be described like mix of rock and electronic and was inspired by artists like Celdweller, Blue Stahli, KoRn, Skrillex, Linkin Park, Pendulum and others. Raizer released three singles by now. 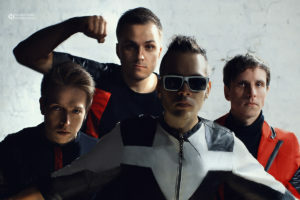 AI, Fall and We are the future can be listened at https://raizer.bandcamp.com/. All of them were highly acclaimed by critics. Guys are grow in this music direction and continue to record new songs and touring also. With their visual style and effects their concerts give the great experience. One can say that Raizer is one of the most interesting young artists in Eastern Europe, and acquaintance with their music is highly recommended.